According to Warren Bobrow, mixologist and author of Cannabis Cocktails, Mocktails and Tonics, cannabis and cocktails are a natural fit—and not just because of their, ahem, mood-altering properties. “Back in the day, before refrigeration, delicate herbs and spices were preserved [by creating] basic tinctures. Cannabis can be extracted using these same methods and dispensed into craft cocktails,” he says. And if you enjoy sipping on classics made with bitters (whiskey standbys like Old Fashioneds, Sazeracs, and Manhattans all feature the ingredient), the likelihood that you’ll dig the taste of cannabis concentrates is high. Think flavors like pine and lemon as well as herbaceous thyme and oregano. Want to try for yourself? Head to California and order one of the three cocktails below. 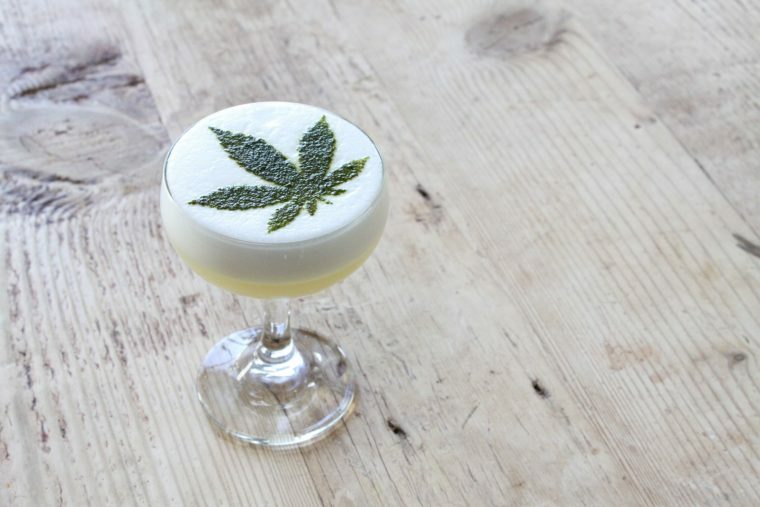 Danny Kuehner, bar manager at Madison on Park in San Diego, recently put his first cannabis cocktail on the menu. The Mr. Nice Guy fuses mezcal, CBD oil (made with a coconut oil base), matcha, pineapple, coconut milk, and lime. Kuehner says CBD oil is a great cocktail ingredient because it has low to no psychoactive effects and a unique, earthy flavor profile. San Francisco’s Flore serves a full CBD-based happy hour—and owners Aaron Silverman and Terrence Alan have sights on turning the cafe into a cannabis hotspot when California’s full legalization hits in January 2018. The menu (which you can order from starting at 4:20, natch) has four mocktails and 11 alcoholic cocktails, including the Cinnamon Kissed Cherry: cinnamon-infused whiskey, Cherry Heering, cherry bitters, pineapple juice, lemon juice, Angostura bitters, and OG Kush CBD oil. One of Los Angeles’ most popular plant-based restaurants, Gracias Madre, has started using CBD in its cocktails. The Sour T-iesel is mixed with tequila blanco, lime, mint, matcha, aquafaba, and CBD oil. A touch of agave adds sweetness to the drink’s otherwise strong and bitter flavor profile. Other cocktails on the menu featuring CBD oil include riffs on the Negroni, Old Fashioned, and a nonalcoholic hibiscus raspado, a Mexican ice dessert. If you’re curious about incorporating cannabis into your wellness routine (sans alcohol) but not sure where to start, read this. And here’s why you might want to work cannabis into your next detox—seriously.